1 - 14.00 PTFe grafts, Marc Van Sambeek Start time : 0min.25s. 2 - 14.10 Do low profile grafts compromise durability? Sonia Rochey Start time : 11min.16s. 3 - 14.20 5 year results of a new generation device, Michel Makaroun Start time : 20min.15s. 4 - 14.30 Latest flexible graft design and early results, Michel Bartoli Start time : 30min.1s. 5 - 14.40 How do the French Engage study compared with international registry? Ludovic Canaud Start time : 38min.22s. 6 - 15.00 Open surgery is as good as endo: lessons from IMPROVE trial, Janet Powell Start time : 47min.30s. 7 - 15.10 Forget the knife: EVAR is a most valuable option in all ruptures, Frank Veith Start time : 53min.0s. 8 - 15.20 Discussion Start time : 60min.0s. 9 - 15.30 Local anesthesia for ruptured AAA. One key to improve survival? Jan Heyligers Start time : 72min.55s. 10 - 15.40 Standard EVAR is not applicable in all rupture cases: my tricks to treat 100% rupture cases endo, Mario Lachat Start time : 82min.45s. 11 - 15.50 Discussant, Claude Angel Start time : 92min.45s. 12 - 15.55 Open repair for rupture: recent tricks which have improved the results, Adel Khayati Start time : 97min.16s. 13 - 16.05 Discussion Start time : 103min.44s. 14 - 16.40 Concept and new graft design to overcome the issue, Fabien Koskas Start time : 115min.41s. 15 - 16.50 EVAS: any doubt left after more than 300 procedures and the European register? Ian Loftus Start time : 128min.30s. 16 - 17.00 Discussion Start time : 139min.19s. 17 - 17.10 Preoperative use of an electronic simulator, Jean-Nöel Albertini Start time : 143min.0s. 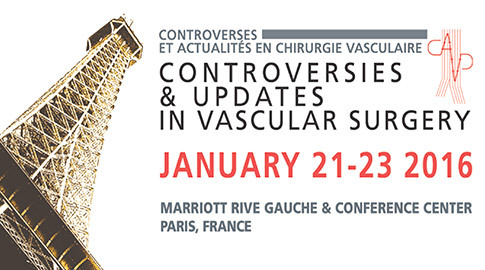 18 - 17.20 Hypnosis for endovascular interventions: an overview, Véronique Mercier Start time : 159min.50s. 19 - 17.27 Hypnosis for EVAR: it works! Can you believe it? Asmaa Khaled Start time : 169min.40s. 20 - 17.35 Fascia suture is cheaper than preclosing device but is it as safe? Thomas Larzon Start time : 200min.0s. 21 - 17.45 Can endostappling improve the results of EVAR? Jean-Paul de Vries Start time : 212min.20s. 22 - 17.55 Thrombus lining in an EVAR stent graft: is it harmful, should it be treated? Hence Verhagen Start time : 221min.40s. 23 - 18.15 Why stopping the follow up put your patients at risk, Michel Bartoli Start time : 234min.0s. 24 - 18.45 New tools for clinical research studies, Fabien Leclercq Start time : 245min.50s. Duel. Is the debate about ruptured aneurysms treatment over?